InGRID loves sleeping, eating, walking and most of all, laughing. Also puns. 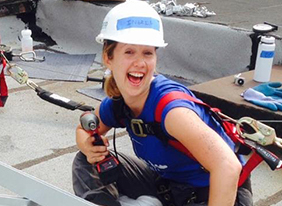 At GRID, she works with policy makers, regulators, utilities, solar companies, and community organizations throughout the country to expand solar access via thoughtful policies, regulations, and program design. She is also a contributor to lowincomesolar.org. Previously, InGRID worked in environmental compliance and permitting for utility scale wind and solar developers in the Midwest. Other experience includes environmental consulting for high voltage transmission lines, liquid natural gas pipelines, and renewable energy projects, as well as nonprofit environmental and clean energy advocacy. InGRID's degree is from Gustavus Adolphus College in St. Peter, Minnesota in Environmental Studies and Political Science.